Elmore lives all alone in a maple tree, lonely without any friends to play with. Even when he posts a "friends wanted" sign in the forest, no one wants to hang out with him. You see, Elmore is a porcupine, and all the other forest creatures think he's "too prickly" to be around. But when his family reminds him that his quills are what make him special, Elmore hatches a brilliant plan to show his neighbors what "a beautiful porcupine" he really is. 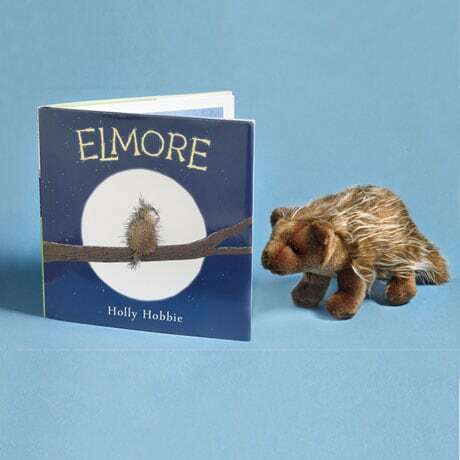 Little readers will love this heartwarming tale by acclaimed children's writer/illustrator Holly Hobbie, especially if story time involves snuggling up with our soft, cuddly, not-at-all-prickly 11" Elmore Plush! For ages 3 to 7. Book (UQ0512) and plush (UQ1212) sold separately.